Michael “Murch” Powers was born on February 7, 1952 to Doris and James Murchison in Bayonne, NJ  close to New York’s borough of Staten Island. Young Michael worked at his dad’s restaurant, The Silver Moon, also known as "Murch's". Following his early interest in music, Michael spent his pay at Wolfson’s Record Store. He also traded his Motown 45rpm’s for British blues records, with English sailors coming through town. Mother Doris collected catalogue-credit stamps and used them to purchase Michael a guitar at age seven, as he often now sings about. The great Blues guitarist Jimmy Reed performed nearby and showed Michael his first "A-barre chord". Michael spent summers on the tobacco fields of North Carolina, and evenings were spent listening to blues porch-men sing and play harmonica and guitar. In the late 1960’s, Michael formed The Apple Core Band, who eventually opened for both "Steel Mill" (Bruce Springsteen) and for Blues harmonica virtuoso and singer James Cotton. Cotton then hired Michael as guitarist, during his school summers off. Later, Michael formed "Moonbeam", a band which stayed together for 13 years, performing all over the USA, opening for James Brown, Bo Diddley, the Ronettes, and others. Michael's two Blues CD's received five (Memphis) Blues Music Award nominations, at whose Awards Gala event Michael has performed twice. When not touring global Blues and Rock festivals, the Michael Powers Frequency Band holds a residency at Terra Blues, New York’s leading Blues club on legendary Bleecker Street, in Greenwich Village. Michael’s collaboration with the ZOHO label started in 2010 when he provided two stand-out instrumental tracks to ZOHO’s J J Cale CD project (“Tribute to J J Cale  The Instrumental Sessions”, ZOHO ROOTS ZM 201008). 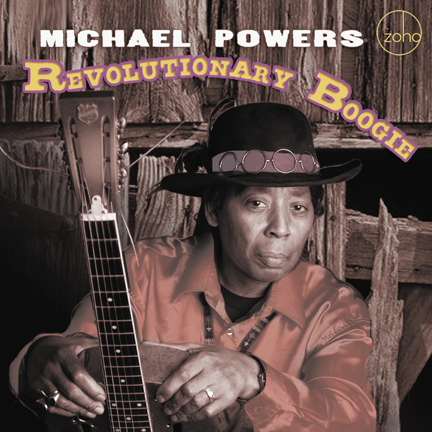 With Revolutionary Boogie, Michael presents his first full length CD recording for the label, with eclectic choices of covers and originals, cutting across several Blues, Classic Rock and Americana genres. “This is how music should be, no one should be restricted to a category”, he comments. Michael sings on his original I Miss Your Kissin’. Guest pianist is the 9 x WC Handy “Best Blues Instrumentalist-Piano” Award nominee Henry Butler from New Orleans. Though blinded by glaucoma since birth, Butler is a pianist of incredible musical diversity, reflecting the exciting cross-cultural gumbo of his New Orleans birthplace. Backing Michael on vocals is the sweet, melodic Angel Rose, and bassist Charlie Torres adds congas. Michael’s originals Bleecker Street Strut, Uprising, and the title track Revolutionary Boogie let loose his take-no-prisoners rock‘n roll, featuring who’s-who guests Charlie Torres on bass and Neil Burton on drums. 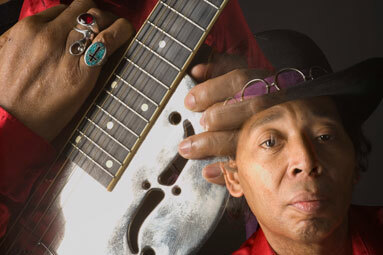 Danny “Doc” Lane is featured on slide guitar. The originals Got’s To Go, Power of Midnight Lightnin’ and Lookin’ for the Truth feature the powerhouse mainstays of the Michael Powers Frequency Band, consisting of the steady-force of Barry Harrison, drums and Billy Cristiani, bass. Power of Midnight Lightnin’ is a stormy love song which features guest pianist John Colianni, formerly with Lionel Hampton & Mel Torme and currently with the Les Paul Trio. Colianni’s style has been described as reminiscent of the great Art Tatum. Playing rhythm, lead and bass simultaneously, sometimes using his rings, Michael’s live show spans from Muddy Waters to Jimi Hendrix, as he regularly plays tributes to both. He covers Hendrix’s Spanish Castle Magic this time, recorded at Brent & Gig Lizzy’s 30 Below Studio in New York, who also mixed this song. The gifted 2x Grammy nominee Angel Rose is featured as lead vocalist on It’s About That Time, to which she also contributed lyrics. Rose, also a Jazz and Opera singer, proves up to the task, with all of her octaves a perfect match for Michael’s outrageous guitar and Neil Burton’s dynamic drums rollin’ & a’tumblin’. Rose has worked with Quincy Jones, Dizzy Gillespie, Michael Jackson, Chaka Khan & Bruce Springsteen. She is also Michael's vocal coach on this CD. Producer Eric R. Durham shows he's a seasoned arranger, like his late iconic dad, Eddie Durham (composer, arranger, guitarist, inventor, trombonist: www.DurhamJazz.com). This is the first time Michael has featured another lead vocalist, or an arranger, on any of his recordings. With the three classic Blues covers Honeybee, I Ain’t Superstitious, and Shake Your Moneymaker, Michael pays tribute to the three giants of the Blues world Muddy Waters, Bill Dixon, and Elmore James, respectively. They were recorded at Checkerboard Zebra Studios in Maui, Hawaii in May 2009. They were organized, co-produced, mixed and mastered by KEAO-LP Mana’o radio personality & bassist Uncle Don Lopez, with Miguel Sobel, percussion, and Paul Marchetti, drums. This trio performed live with Michael in Maui. Mana’o means “sharing thoughts, ideas, opinions”. Michael sings Lookin’ for the Truth, a rock-folk song about youth, with Angel Rose in vocal unison, a technique inspired by the Rolling Stones’ anthemic “Gimmie Shelter”. Got’s to Go (Rose’ lyrics) recants the irony of being in love as a traveling performer. The song returns in a fiery instrumental version called Gotta Go Right Now, as a bonus track at the end of the album. Producer Eric R. Durham (Brooklyn) composed, performed, toured & recorded as guitarist with Ben E. King, Cameo, etc. His Studio One produced Michael Powers’ contribution to ZOHO’s J J Cale project. On this CD, Durham produces nine and mixes eight songs, adding horns, organ fills, rhythm guitar and sound effects. He is co-writer of the song Uprising. Eric’s first rate production and arrangement skills significantly contribute to the success of Revolutionary Boogie.